Jazz up your jarred spaghetti sauce! Heat sauce in small saucepan over the stove and add 1t fennel seeds, 1/4C dry red wine, 1-2 cloves fresh pressed garlic, 1T extra virgin olive oil, and a bay leaf. You can also add 1T each of fresh minced herbs like rosemary, basil, and oregano to the sauce before heating it. Bring to a boil, then simmer until ready to use. Use 2 jars of sauce, so you have extra leftover to serve on the side with the lasagna for those that like to add extra sauce to each serving of cooked lasagna. Healthy Hints & Tips: fennel seeds are what give Italian sausage their unique flavor, when you add the seeds you get the same taste without all the fat and extra calories. Wash eggplant and slice lengthwise into thin strips. 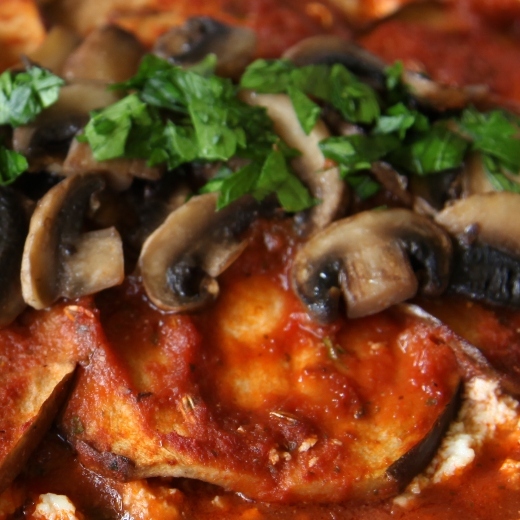 The eggplant strips will be your lasagna "noodles". Salt both sides of each eggplant slice and set aside. You can lay the eggplant slices on paper towels or in a glass dish or plate. Salting eggplant strips helps remove bitterness. Lightly steam or wilt the spinach, set aside, and let cool. In a small bowl, mix the ricotta, egg, salt, and pepper. If you are making this vegan and are using tofu instead of ricotta, omit the egg and mix the tofu with the salt and pepper until you have small pieces. Chop the spinach and mix into the bowl, then set aside. In a 9" x 13" glass casserole or baking dish, spread a little bit of the sauce on the bottom of the pan. Lay a strips of eggplant across the pan forming a layer of eggplant "noodles". Depending on the size of your eggplant strips you can lay then lengthwise or sideways across the pan but make sure they all go in the same direction for easier slicing when the lasagna is finished. Add a little of the ricotta or tofu and spinach mixture down the center of the eggplant strips and top with a little of the spaghetti sauce. Top with another layer of eggplant noodles and repeat until you have used all ingredients and/or the baking dish is full almost to the top. Put in middle rack in preheated oven and bake 30 minutes or longer until mixture is heated through...sauce will start to bubble along edges. In the meantime, Wash and slice the vegetables you are using. You can use mushrooms or substitute with chopped bell pepper and onion or use all three of them. Put the oil in a skillet and heat over medium heat. Add the vegetables and pressed garlic and saute until the vegetables are tender then set aside. Wash and chop Italian parsley and set aside. 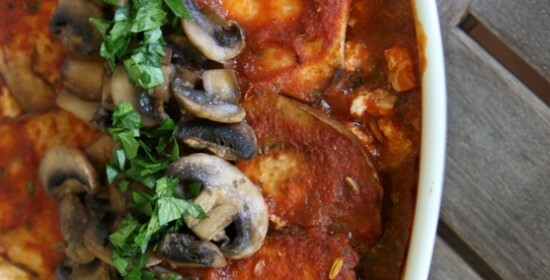 Remove cooked lasagna from oven and top with cooked vegetables. Lay the vegetables in a thick strip across the top of the lasagna, lengthwise down the baking dish and top with the chopped parsley (optional). Cut lasagna into large pieces and serve. You can heat extra spaghetti sauce to serve along with the lasagna.